Kyle Knits - a boy, his cats and way too much yarn: My First Sweater! I am a proud boy. After about 3 years of knitting blankets and scarves, I completed my first adult piece of clothing! 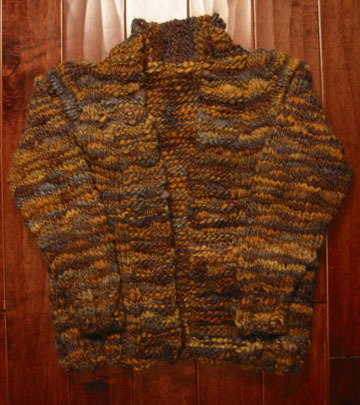 This sweater pattern was from Vogue Knitting - I think 2 issues ago - it's done in a yarn called Trendsetter Yosemite - and I'm very proud of it - the only problem I really had was relating to some of the "new" stitches that I had to battle - but I faked it pretty well! (if I do say so myself!) - I am going to do the same thing again in a different yarn (just some wool yarn I got at my local yarn shop) and see if I can do it correctly this time. The second sweater is all one color, so it'll be less forgiving.